When working with my English classes, I try very hard to make sure that we examine each author’s style – whether we are studying Shakespeare or Harper Lee or Etheridge Knight. One of the ways that I try to get the students to connect with the author is by asking them to think about which sentences or passages they wish they had written. In addition, I have kind of c0-opted, if you will, Dan Pink’s idea of What is Your Sentence? while taking a look at sections we have read. (If you’re a twitter person, you can take a look at some student choices from To Kill a Mockingbird here and here and here). I will freely admit that this hasn’t happened to me that often with movies — with a few exceptions (“Kramer vs. Kramer,” with Cameron in “Ferris Bueller’s Day Off” and also with “Jack the Bear”) immediately come to mind for this “category.” I mean, I absolutely love “Seven,” and could watch it over and over and over, but I’m glad I don’t typically associate with serial killers. 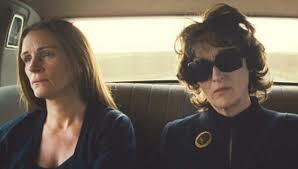 And then I saw “August: Osage County” this afternoon and was just dumbfounded. 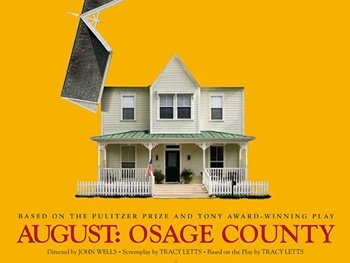 For the life of me, I can’t figure out how playwright Tracy Letts knew about my life as I was growing up with my Mom in Albuquerque in the 70s and early 80s. Beyond Letts’ absolutely incredible writing – and make no mistake about it, it was absolutely incredible – the acting was just top notch. Julia Roberts was very good and Chris Cooper was his usual solid self. Sam Shepard — who I’ve always liked since seeing him play Chuck Yeager in “The Right Stuff,” was just… Sam Shepard, if that makes sense to you. Even though Letts originally wrote the story for the stage, you’d think he had Streep in mind to play the matriarch of the Weston family. She just let everything go and let it all out and truly became Violet Weston, warts and wigs and F-bomb dropping and drug addicted and all. And she reminded me so much of my mother that I couldn’t help but sit and stare at the black screen after the credits had ended, trying to compose myself while also wondering just how it was that Letts knew. I’m not sure how he knew of the conversations — make that yelling matches — we had when I was 11. I’m not sure how he knew about the fights we had and me literally tackling her to try to get the cocaine away from her. And I’m definitely not sure how he knew the ways she would so bitingly yell at me, telling me time and time again that I’d amount to nothing. This entry was posted in daily life of a teacher, just random and tagged August: Osage County, Brilliant Disguise, Bruce Springsteen, Chris Cooper, Jack the Bear, Julia Roberts, Kramer vs. Kramer, Meryl Streep, One, Sam Shepard, Sheryl Crow, So Cruel, The Difficult Kind, Tracy Letts, U2. Bookmark the permalink. ← Are our students missing out on some great reads?